Chili and lemon come together to create this delicious sweet and spicy treat. 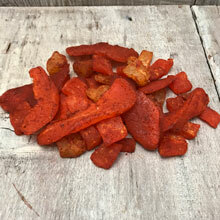 This tropical fruit mix contains juicy dried mango, papaya, and pineapple, covered in chili lemon seasoning. It's definitely a snack with a kick! Price quoted is per pound, not including shipping.